Mark your calendars now for Sunday, April 12th from 11am – 6pm, because the stage is set for the 16th Annual Award-Winning Kaneland Community Fine Arts Festival. Plan your day to celebrate the Arts by downloading the 2015 Festival Schedule. While you may not spend all 7 hours celebrating the Arts, you will want to plan, as there are hours of activities available for the entire family to enjoy! The Festival workshops are always a great draw and lines form early to have a caricature drawn by Michael Shiroda or to create a piece of glass jewelry with Larry Cimaglio. This year, local artist Dan Connelly is creating metal jewelry with guests and the circus is in town with a unique workshop presented by CircEsteem. Performances will not disappoint with the harp playing of Laura Fako Utley or the hammered dulcimer performance by Phil Passen. On the auditorium stage, you will discover tap dancing from the Chicago Tap Theatre and an amazing 14 year old virtuoso piano player, Daniel Souvigny. Meet our featured artist, whose fabulous design is the Festival program, posters, and tee shirts. The drawings of Chris Hodge will astound and fascinate you along with the other professional artists. The wee ones will want to follow the footsteps down the hall to the Pre-K Art Experience in the Fox Valley Career Center childcare rooms to hear stories and create art appropriate for little hands. The 16th Annual Kaneland Community Fine Arts Festival is a smorgasbord of senses, delighting the ears and amazing the eyes. 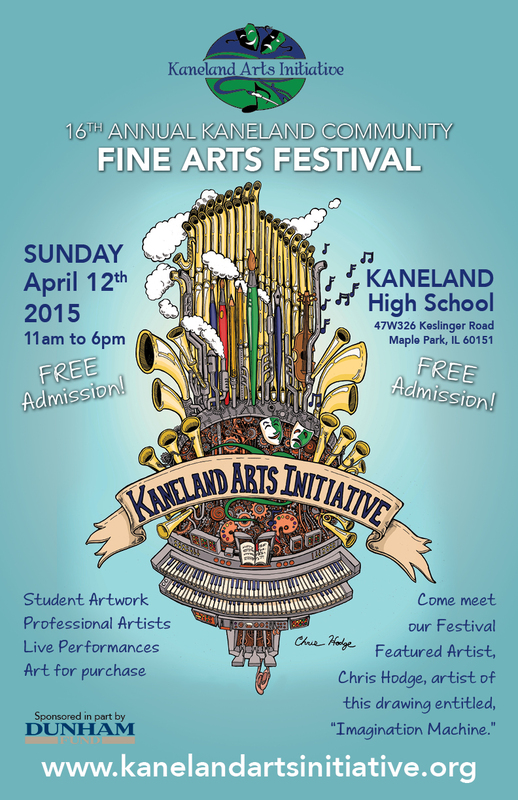 Brought to the community by the Kaneland School District and produced by the Kaneland Arts Initiative, the Kaneland Community Fine Arts Festival is free to the public. Take a look at these fabulous performances! The * denotes people who are donating an item to the auction. 2:30 – 4:00 pm CircEsteem, HS Commons – Walk-Ins Welcome!